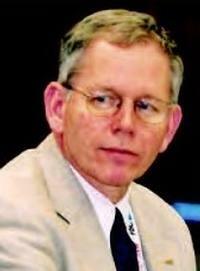 HAI Director of Heliports and Technical Programs Bill Sanderson lost his long battle with cancer April 20, 2004. Bill had a distinguished career in aviation. A Long Island, New York native, he was a graduate of the U.S. Naval Academy with a B.S. in Physical Science (Class of 1973). He also held a Master of Science degree in Administration from George Washington University and ratings as an airline transport pilot, multiengine land, and commercial helicopter with instruments. Bill’s naval career centered on the development and operation of anti-submarine helicopters. He served as Executive Officer of HSL-44 in Mayport, Florida and at the Center for Naval Analyses in Alexandria, Virginia. In his last Navy assignment he was Executive Officer of Atsugi Naval Base in Japan. At HAI since June 1997, Bill assisted large airports with needs for multiple helipads and managed administrative, personnel, operations, security and strategic planning at HAI – all related to heliport development. He negotiated aircraft noise abatement procedures with foreign governments and lent his expertise to support the creation new, more efficient, airport traffic area arrival and departure procedures for helicopters. When asked, which was often, Bill presided over public affairs programs and handled politically sensitive issues with local cities. In recent years, Bill worked closely with AHS and Dr. John Leverton to improve the FAA Heliport Design Advisory Circular and ICAO Annex 6 (Operations) and 14 (Aerodromes). He was a frequent participant at recent AHS events and most recently led HAI heliport activities at HAI’s 2004 Heli-Expo in Las Vegas.